The original King's Quest came out in 1983, which isn't particularly relevant to today's announcement of a launch date for the new King's Quest except as a reminder that if you played it, then you, like me, are old. Don't feel too bad about that. So is King Graham of Daventry, after all, although the actual adventuring bit in the new game will focus on Graham as a young man, in adventures recalled by the aging King as he passes some time with his granddaughter Gwendolyn. Those adventures—all new, by the way, rather than rehashes of past games like Romancing the Throne or Absence Makes the Heart Go Yonder!—will unfold over five chapters plus a "bonus playable epilogue," beginning with A Knight to Remember on July 28. Activision said last year that the new King's Quest is "not a point-and-click game," but when Wes took a short test-drive in March, he found it to be mainly in that vein. "It looks and moves like [Telltale's] The Walking Dead, but plays much like a point-and-click adventure," he wrote. 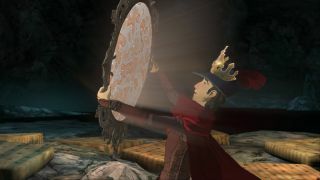 "The game’s recent trailer, showing Graham traipsing around the 3D environments, made King’s Quest look like a platformer. That’s the skin. The bones are pure classic adventure." King's Quest: A Knight To Remember will be available for $10, or you can go for the whole thing up front for $40. The promised preorder link on Steam doesn't seem to actually be live yet, but I'd expect some action on that front very soon.